Have a seat. There’s a lot going on out on the concourse. Luggage wheels glide down the polished floor. Shoes click and squeak. Television screens flicker with color, broadcasting news from around the world. The airport terminal gently shakes from the startup of an engine and propellers. Outside, a plane moves down the runway, gaining speed and lifts off into the sky. It happens all day at Norman Y. Mineta San Jose International Airport—SJC for those familiar with the airport code. SJC is five miles from San Jose State’s campus, down Market Street and then Coleman. It’s the place where Silicon Valley comes and goes, and now it has a special place for Spartans. In Terminal B, across from Gate 18, is San Jose State’s new “power suite.” The airport’s more than 780,000 monthly travelers can now enjoy a seating area with charging stations and a mural that shows SJSU’s alumni and faculty members against the backdrop of a region they’ve shaped through service, creativity, entrepreneurship and collaboration. We’ve been here for more than 160 years. We are the heart of Silicon Valley. And now SJSU’s story is really taking off. You have to go inside the suite to experience it. Just like you have to get to know our people—our humanity, compassion, our commitment to change—to know SJSU. There’s a story behind every Spartan in the mural and all those stories add up to something greater. Not just the oldest public university in the West, or Silicon Valley’s only public university. But a place where people can take hold of their futures and those of their families and communities. According to Money magazine’s rankings, SJSU is the fourth most transformational university in the country. That’s right, in the United States. And SJSU is the only public university in the top five. “What’s impressive is when a college helps students do far better than would be expected from their academic and economic backgrounds,” reported Money. “We call this a college’s value add.” But the ranking only tells part of the story. SJSU is the runway for sure, but the people do the transforming. Spartans create their own futures. That’s who we are. We do the unexpected. This holiday season, if you’re traveling through SJC, check out 70 feet of pure Spartan glory, full of alumni and faculty members against a blue and gold San Jose skyline. The Spartans in the mural are just like you. They’re larger than life. Take a Seat. Take a Selfie. 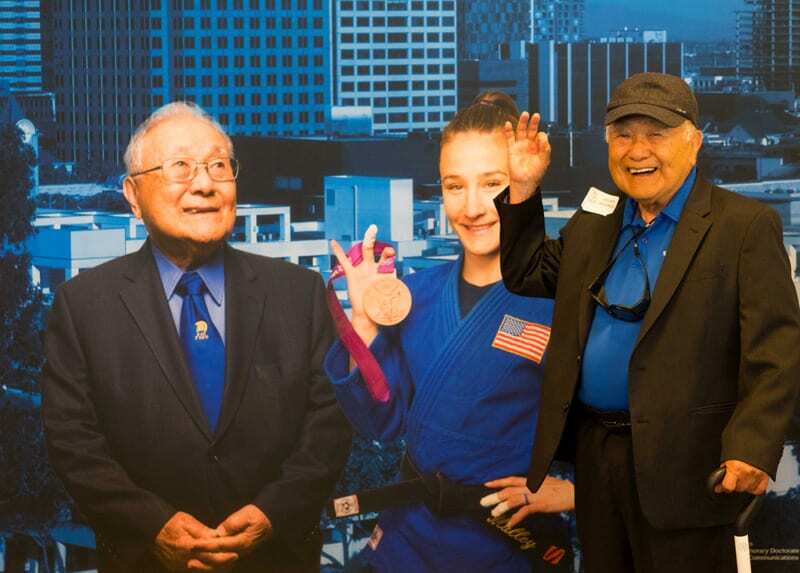 Legendary judo coach Yosh Uchida, ’47 Biological Science, ’04 Honorary Doctorate, had his selfie moment. Share your own photos from the “power suite” with #SpartansFlySJC.